A dental veneer is the type of reconstruction used by a dentist specialising in esthetic dentistry to improve the look of the patient’s smile. The veneer is attached to the tooth like a mask and covers defects or stains. Nowadays, dental or esthetic veneers have many uses. They are a quick, effective and very attractive way to solve several dental problems. Here are some examples of the types of clinical cases we treat. Click to see the complete case. Dental veneers are thin layers of composite (resin) or porcelain that are attached to the teeth using very sophisticated techniques that ensure they last for a very long time. Once attached to the teeth, dental veneers help to improve the look of the smile. What is the main difference between porcelain veneers and composite veneers? The main difference between porcelain veneers and composite veneers is how long they last. Porcelain veneers remain intact for many more years than composite veneers. Although they provide a good esthetic result, composite veneers need more maintenance and will need replacing before porcelain veneers. Is it always necessary to drill or reduce the size of the teeth for dental veneers? Whether drilling the tooth is needed or not will mainly depend on what the patient wants to achieve with their esthetic dentistry treatment. If the patient just wants to change the colour of their teeth, it is not necessary to drill the teeth for the veneers. If, as well as changing the colour, the patient wants to improve the shape or position of their teeth, it will be necessary to drill the teeth, but in proportion to the change they hope to achieve. If the patient wants to create small changes, there will be less drilling involved. What type of dental veneers are used for dental veneers with no drilling? There is a type of veneer known as micro veneers which are manufactured in a dental laboratory after the smile has been digitally designed and approved by the esthetic dental specialist and the patient. There are also dental veneers called Lumineers, which are not made in Spain, meaning the treatment usually takes longer than for micro veneers. Both give excellent esthetic results and can be used with only slight recontouring of the base of the veneer to create a better look. What is the procedure when the teeth need to be drilled? If it is necessary to drill the teeth, the first stage is the smile design. 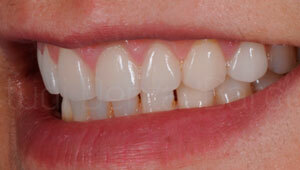 The teeth are then prepared, and provisional dental veneers are added. 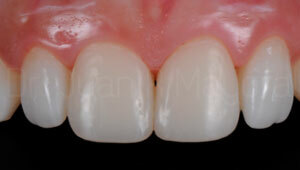 The final porcelain veneers take a week to be manufactured in the dental laboratory before they are fitted.